This 1 Bedroom, 1 Bathroom condo at Storm Meadows Club C is a skiers delight. As well as direct access to the slopes, the condo was completely remodeled to provide a new comfortable, modern interior. The stunning, fully equipped kitchen features granite tile, alder cabinets, stainless steel appliances and some exceptional extras for the discerning guest (including a built in wine cooler!). The open kitchen and living/dining area provides a wonderful space to relax in at the end of the day. Plush comfortable sofas and a real wood fire (plenty of logs provided!) make this cozy mountain retreat a delight to unwind in. Complete with flat screen TV, stereo system and DVD player, the condo can sleep 4 comfortably, with 2 on the queen sleeper in the living area and 2 in the spacious king bedroom. The bathroom has also been completely remodeled and is now a small sanctuary of alder cabinetry, and travertine tile. The bathroom has a single vanity unit and bathtub with shower. A balcony off the living area houses a gas BBQ grill and small seating area with patio furniture allowing you the opportunity to enjoy warm spring afternoons and summer evenings. Access to the slopes at Storm Meadows is as easy as clipping on your skis at the back door and taking the short ski trail that connects Storm Meadows to the 'Right-o-Way' ski run (green run). From here you can access the Christie III chairlift or carry on a little further down to the Gondola or new '6-pack' Christie Peak Express. Just a few yards from Club C is the 'Storm Meadows Spa', a wonderful modern facility that houses a large, heated outdoor pool and hot tub as well as saunas, changing rooms, a fitness center and tennis court (summer only!). The Storm Meadows scheduled shuttle service (winter only) is provided for the exclusive use of Storm Meadows guests and runs to Gondola Square, Ski Time Square, the grocery stores and Downtown Steamboat - all of which are just a few minutes away. 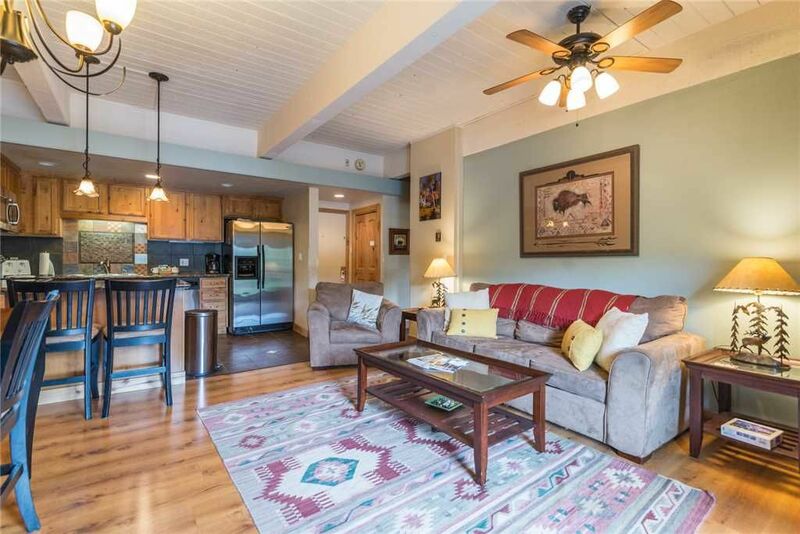 With an unbeatable location, plenty of on site amenities and a comfortable, modern interior, you'll find our 1 bedroom condo provides great value for money and all the ingredients for a simply unforgettable vacation in Steamboat Springs! We are a local company with employees who love where they live and share that love with all our guests and property owners. After all, who wouldn’t love living and visiting here? We think you will and we do everything we can to ensure you will want to come back every year. If you are looking for a relaxing vacation in a unique and luxurious property with a friendly and efficient management company; chose Simply Steamboat and have a simply great time. Storm Meadows is located away from the noise of the base area but still gives you great ski, hiking or biking access with the trails or the shuttle in the winter. Our condo has been completely remodeled and is one of, if not the, nicest 1 bedroom in all of Storm Meadows. Nice location, noisy with lots of kids running around but it would quiet down late at night. This was a very attractive condo. Ski in/out worked well most days (until it got too warm and the snow started melting.) Saw moose and elk near the property. Kitchen is well stocked. Only complaint is that the sleeper sofa is in rough shape and left my son with back pain every morning. If they fix that, it will be near perfect! Thank you so much for the kind words and detailed review. We are sorry to hear about your poor experience with the sleeper sofa, and understand that most sleeper sofas can be less than comfortable. Please reach out next time about an air mattress, which we would be happy to setup in the condo for the duration of your stay. We hope to have you back to stay with us (and the moose!) in the near future. Overall a good room, nice kitchen, dining and bedroom. Couch is ok but not the most comfortable. Great shuttle service, very fast and efficient. Ski out is nice. Ski in is a good 1/4 mile and you have to pole it a bit. I've stayed at a lot of different places in Steamboat. This is a good value for the price. We have gone to Steamboat for 26years now. Luckily we had a friend who let us stay in his condo. Unfortunately he sold it this year so we were on the hunt looking for a new vacation home. This place is smaller than we had before but very nice. Upgraded and comfortable. The only thing that was bad was no view. The balcony faces the parking lot. The trees are lovely to look at but we are use to the view of the mountain. If you are going to be gone allot and this isn't important, this is your place. Bathroom s a bit small and if you're going to eat pizza, bring your own cutter. OtherwIse it was a nice stay. But we will still be looking for a better view I'm afraid. Thank you so much for writing a review for this condo. We appreciate any and all criticism, it helps us make the experience for all guests exemplar. Unfortunately, the way the building is laid out, all of the 1 bedrooms in the Club Buildings in Storm Meadows don’t have great views. When you come to Steamboat next year we would be so happy to find a condo that has amazing views. Also thank you so much for letting us know about the pizza cutter, all Simply Steamboat units are stocked with this item - we will be looking into replacing it asap! Thank you again and hope to have you back next season. This property was great! Very clean, nicely remodeled condo and close to everything. Ski in/ski out was nice. The only issue I had was the bed being very very uncomfortable. My wife and I could not sleep in it after one night. We had to buy a foam mattress pad to make it a better stay. After that everything was great! I would recommend this condo for a couple or couple with 1-2 children. It was too small for 4 adults. This condo was the perfect spot for our family of 4! It had everything we needed and was a great location for us. This condo provided Coffee maker, blender, crock-pot, dishes, pots and pans, cookie sheets, everything you need--just like being at home. From the ski lockers, to the access to a green run, and everything in between--it made a perfect Spring Break! Once we got there on Sunday and parked our car, we didn't move it until we left. The shuttle service for Storm Meadows that took us all over Steamboat was the only way to go! Thanks again for sharing your condo with us! We hope to return soon!